The WM4000 is the ‘next generation’ in thin-kerf sawmilling. The WM4000 combines the profitability enhancements of thin-kerf blades with productivity advances in automated sawing technology to create an ideal solution for any sawmill. Only one operator is needed to manage log handling, sawing, and timber removal for further processing making the WM4000 a highly profitable machine. 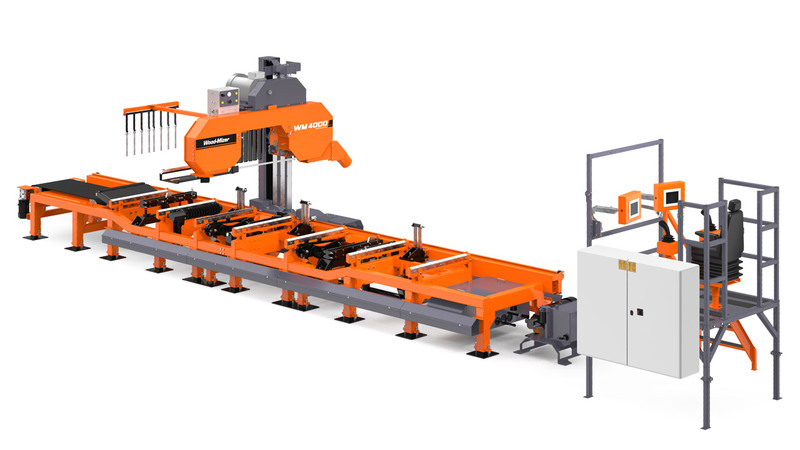 The WM4000 adapts easily for whatever cutting requirements are needed and delivers higher log yield at lower investment and operating cost than alternatives, increasing profitability and ability to produce diverse products quickly. The WM4000 can be used as a standalone sawmill to process all required materials, or as an addition to an existing sawmill to process irregular logs or to produce custom orders that existing equipment is not suited for. The advanced PLC setworks are displayed on a 19 cm touch-screen monitor which presents board and cant sizes along with current head height, feed position, and blade power. The setworks feature new ways of increasing productivity and reducing steps required in the sawing process, including remembering the start and stop locations of the log to reduce unneeded head movement. A built-in powered board conveyor automatically turns itself off after moving a board or cant from the sawmill. The log bed is heavily constructed - reinforced with 50% more steel than the WM3500. Servo motors ensure faster and accurate head positioning, resulting in more timber cut in each shift. Powerful hydraulic log handling enable easy manipulation of large logs and several options are available to meet your requirements. Wood-Mizer’s most efficient and powerful industrial PLC setworks system. 50% more steel than the WM3500 bed. Quickly turn and position the log with the heavy-duty turners. Automatically activates when board is being removed.